Howard Schultz Steps Down As Starbucks CEO Schultz, who joined the coffee chain more than three decades ago, will become executive chairman to focus on innovation and social impact activities. Starbucks President Kevin Johnson will become CEO. Howard Schultz, who is stepping down as CEO of Starbucks, speaks at the coffee company's annual shareholders meeting in Seattle in March. 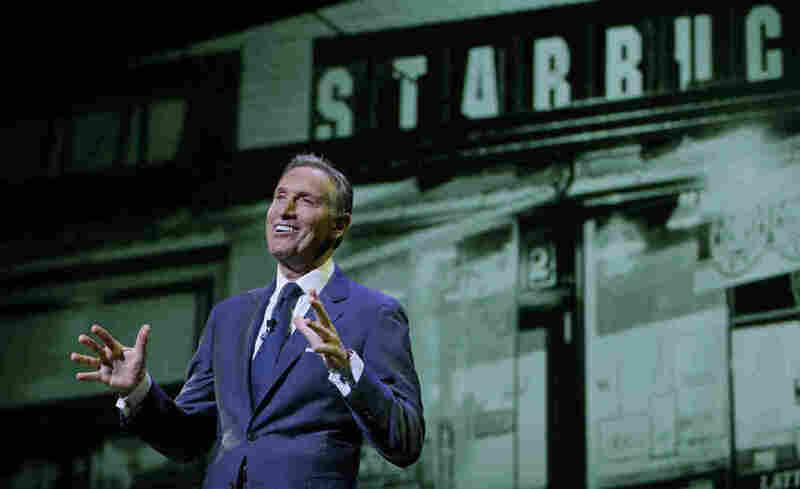 Starbucks Chairman Howard Schultz is stepping down as CEO of the coffee chain he joined more than 30 years ago and transformed into a global brand. Schultz, 63, is credited with turning around Starbucks' fortunes since returning as its CEO in 2008. He has overseen the expansion of the chain's food and beverage offerings and the growth of its popular loyalty program and mobile app. Starbucks CEO: Can You 'Get Big And Stay Small'? Shares of Starbucks slid 3.6 percent to $56.44 in after-hours trading. During a conference call to discuss the announcement, an analyst called Schultz a "master merchant" who has been able to determine and even stimulate "what the Starbucks customer wants and needs" and asked if that "merchant gene" would still be present in those leading the company. Another noted that Starbucks struggled after Schultz stepped away as CEO in 2000, and asked what was different this time. Schultz said the company has built a strong leadership team in recent years. He also noted that he is not leaving the company, and would be working on developing the Starbucks Reserve Roasteries, which are high-end retail concepts featuring coffee beans and drinks like "cold brew" coffee. Schultz called it the "next wave of retail innovation." "But Kevin and the team are in charge," Schultz said. In a note issued before Starbucks announced the change, RBC Capital Markets analyst David Palmer said he believed the company can regain its domestic sales momentum by focusing on expanding its rewards program and the changes it is making to its food menu. Over the years, Schultz has said that people expect more from public companies, and has aligned himself and Starbucks with social issues like race and jobs for underprivileged youth. In September, he publicly endorsed Democratic presidential nominee Hillary Clinton in an interview with CNN, and did not rule out running for office at some point. Schultz said during the call that he has been working closely with Johnson, who joined the Starbucks board in 2009. Johnson, 56, will take charge of the company's global business and operations. He spent years at technology companies including 16 years with Microsoft and five as Juniper Networks CEO.